Under Trump, cities and states are preparing to take the lead, charging ahead on energy efficiency, renewable energy and climate change, regardless of what his administration does. They’ve got a great base to work from, having formed numerous pacts in the past few years that are having lots of success. 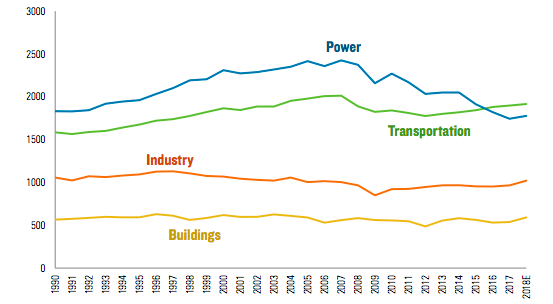 And cities are the linchpin since they generate about 75% of global carbon emissions and 80% of GDP. Since Trump was elected, 10 cities and a county joined the City Energy Project, bringing the total to 20. The Project focuses on energy efficiency of buildings – their largest source of greenhouse gas emissions. The cities are an eclectic mix: Boston; Providence; Philadelphia; Pittsburgh; Chicago; Atlanta; Orlando; Miami-Dade County; St. Louis; Kansas City; St. Paul; New Orleans; Des Moines; Houston; Denver; Fort Collins; Salt Lake City; Reno; Los Angeles and San Jose. NREL could be gone under Trump, of course, taking a plethora of supporting research and tools developed to tackle climate change. On the international level, there’s C40 Cities Climate Leadership Group and Carbon Neutral Cities Alliance (17 of the world’s largest cities). Some cities are reaching for 100% renewable energy, like San Diego, Vancouver and Sydney, Australia. A “Global Platform for Sustainable Cities” launched this year to help cities use green planning processes as they grow and to integrate adaptations they will need to cope with climate change. EU’s Global Covenant of Mayors for Climate & Energy is on track to meet its goal of a 27% emissions cut by 2020. The coalition represents 600 million people – 8% of the global population. In September, 70 cities participated in the inaugural Global Parliament of Mayors at The Hague, with the goal of taking on issues that aren’t being addressed effectively at the national level. Top issues for the meeting were climate change and immigration/refugees. On the state level, renewable energy has been leaping forward thanks to Renewable Portfolio Standards and this year, 17 states formed the “Governors’ Accord for a New Energy Future.” Representing 40% of US population, governors are working together to accelerate efficiency and renewables, modernize the grid, and expand clean transportation. They can put the federal Clean Power Plan into action – and many are on track to meet its targets – by regulating their own power plants, investing in efficiency and renewables. Northeastern states have had cap-and-trade for years under the Regional Greenhouse Gas Initiative and Northwest states have banded together. Internationally, 12 governments – mostly states – signed onto the Under 2 MOU, committing to joint action that keeps global temperatures from reaching 2°C. While cities and states can fill in much of the gap left by a disinterested federal government, it will be hard to battle big initiatives that expand fossil fuels again. TransCanada can’t wait for Trump to approve the Keystone Pipeline and automakers are looking forward to the repeal of Obama’s historic fuel economy standards for cars and trucks. We can forget any new supportive measures for a green economy, and if Congress wants to do some heinous things to squelch progress, they can. How about repealing tax breaks for wind and solar? And forget government support for clean energy innovation, whether it’s pushing our budding offshore wind energy industry forward or a strong R&D budget. Too bad, because for every dollar spent on clean energy R&D, $1.60 is created in other parts of the economy – adding about $8.6 billion to US GDP this year, according to Pew Research. Laughably, Exxon Mobil Corp, says it hopes the Trump administration will rely on “sound science” on deciding which regulations will be dropped. In the end, most people believe the transition to renewables will continue because it’s too far along to be stopped. Coal is waning becaue of low natural gas prices and solar/ wind will be cheaper than both fossil technologies. They create lots of jobs, even in red states.